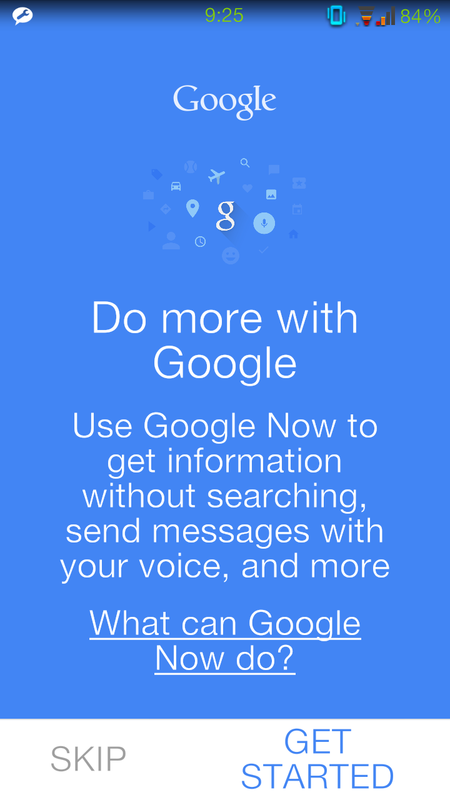 Using Google Now in 2015 – Part 1 | 22 Point Blog! « An initial, low vision look at the Windows 10 technical preview. This week, following a thread in the Eyes Free list, both myself and Warren Carr decided to do a podcast each on using Google Now. So what is it – well if you weren’t tempted by any of those adjectives then in a nutshell Google Now is basically about providing information – an evolution of what we’ve all been doing with http://www.google.com for years, now geared towards providing you not only with the information you need when you need it, but offering it to you before you ask. 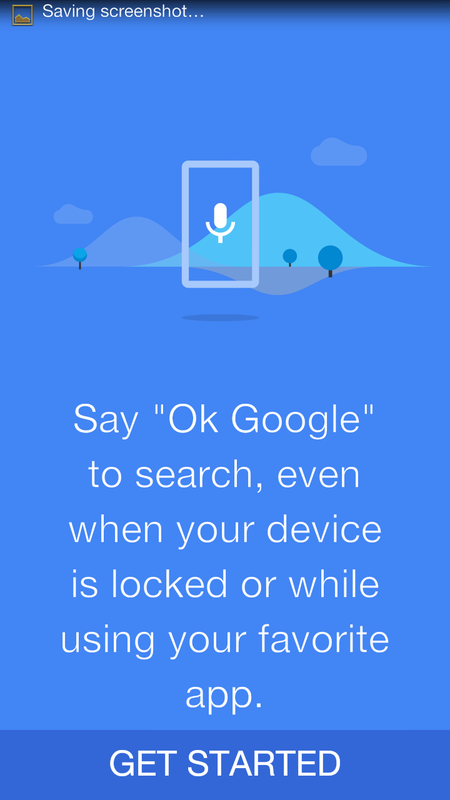 1) You can bring up Google Now by either swiping up from your (software) home button, holding down your (physical) home button, or by saying “OK Google” (or “OK Jarvis” if you want to be a bit different). Note too if you are using Talkback, launching from a device with a software home button (like the Nexus series) is slightly different, you need to find the home button, double tap and hold for about a second and then slide up an inch or so. However you do it, this then starts listening and you can ask it pretty much anything, from what the weather is, or to call one of your contacts, to email someone, to tell you what the square root of 1764 is, or whether the moon is really made of cheese. You can do a few things on your device as mentioned, from turning the flashlight on (“Turn flashlight on”), lock the screen, play music or ask it to wake you at 7am tomorrow morning. If Google Now can’t find a specific action related to your search, then it will do a web search for whatever it was you asked. 2) Google Now, as it learns your habits and interests, will start to offer you “cards” (hopefully) just before you need them. Eg, when you first look at your phone in the morning, it will give you the weather for the day, and before you leave work in the evening, it will tell you how long your drive should take and whether there are any delays. When a website you like posts an update, Google Now will let you know, and when your favourite sports team plays a game, it will keep you up to date with cards. All sounds great, and I can immediately see that there are some improvements since I looked at it last year. – Next, there is a Google Now launcher on Android: https://play.google.com/store/apps/details?id=com.google.android.launcher&hl=en This basically gives you a home screen which looks much like most other launchers, but if you swipe to the left, you get straight to your Google Now cards. 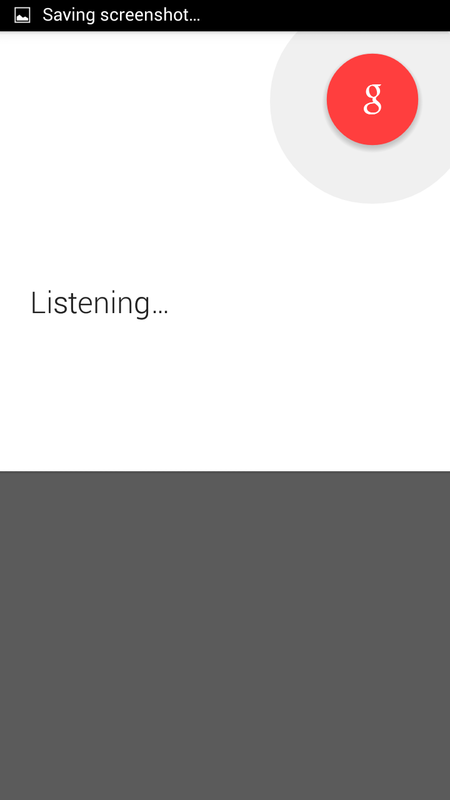 It also listens out for the Google Now keyword (some other launchers, like Nova, do, and some don’t). Personally my only complaint about the Google Now launcher, as with so many others, is that the icons and text are small and there is no way of making them larger, which is why I tend to use launchers like Big Launcher. – It understands more than ever and provides more cards than previously. 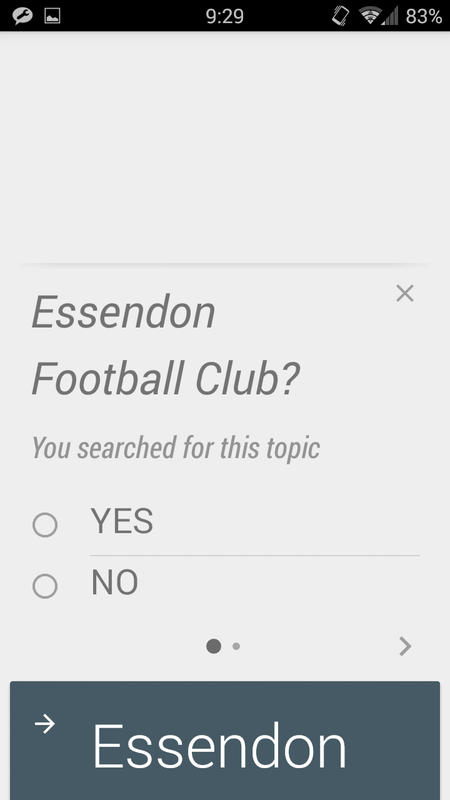 When I set it up, it automatically offered me cards for some of my favourite websites (Art of Manliness, How to Geek and news.com.au) and also offered me cards on the Australian Football League, and my own favourite team, Essendon. – It integrates recent search activity into cards. It offered a couple of cards based on recent searches I’d done – particularly where I’d done multiple similar searches. Of course we all search for some things we are passionate about and would be interested in ongoing information on, and other things we just wonder or want to find out as a one off – if it gives you information you don’t care for, you can simply dismiss any of the cards with a swipe to the side (two fingers for Talkback users). – The directions home from work (not counting that I hadn’t updated my work info since I changed jobs) only offers driving directions in Australia presently. It does offer public transport information in the US and from what I’ve read they’re working on extending that, but for now it’s not so useful. – It was inconsistent at times – when I first asked it to “Call my father”, it suggested ringing “Dad Mobile” out of my contacts – very clever! Yet when I then asked it to “Call Dad”, it had no idea and went off to do a Google search on the term. Interestingly it was keen to oblige with both terms on my tablet… before getting a bit lost when I realised my tablet has no provision for actually making phone calls. – I could ask it to set a reminder to wake me in the morning without problem, but I couldn’t figure out how to get it to show me my reminders or cancel any, so I had to go in and find that manually. – I could ask it to launch apps, and on my tablet it worked fine, but on my phone it gave me a page showing the app at the top of a general Google search with a button there to launch it, yet it didn’t do so automatically. I think it’s this dynamic interpreting of queries as you ask them which is both Google Now’s biggest strength and it’s biggest weakness. If I have a contact in my phone called “Dad”, and I ask it to call Dad, there is no ambiguity there, it shouldn’t have trouble with that. If it can figure out that I also want to call the same contact when I say “Call father” then that’s a bonus, but get the basics right first. Similarly, it’s great that I can get driving directions and the driving time from the office to home, but from the doyen of information provision, I should be able to get the public transport information if that’s how I travel. I think I’ve realised that for the Google Now cards to be most effective, it really needs me to use it for a couple of weeks to get the hang of it. So instead of pronouncing that it’s better but still not perfect, I’m going to give it a go for awhile and see how I find it. If you’re setting it up for the first time yourself. One of the most important things you can do, is a) give it access to everything it needs to do its job – yes it’s scary how much information Google has, but then if you weren’t willing to have a go at this, you probably wouldn’t still be reading 🙂 and b) Wander through the options – there are a number of things you can tweak about Google now, and quite a few things it doesn’t necessarily ask you out of the box which could help your experience, such as what sports teams you like (it sometimes did and sometimes didn’t when I’ve set it up?) It also learns what apps you use and integrates with some of them. For instance if you use the default twitter app, you can post a tweet right from Google now (Say “OK Google”, then “tweet, look mum, no hands!”) but this doesn’t necessarily work with all the third party twitter clients (like Tweetcaster which I use). In the meantime, please do let me know in the comments how you use Google Now and what tips or tricks you’d recommend to get the most out of it! This Post was tagged accessibility, android, google now. Bookmark the permalink.